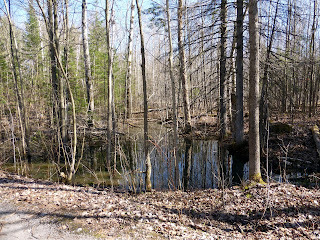 Last Saturday, it was a glorious spring day in Eastern Ontario - sunny and warm, with a lovely fresh breeze. Fran and Holly and I (FEH) decided to create our first on-site installation of the year. 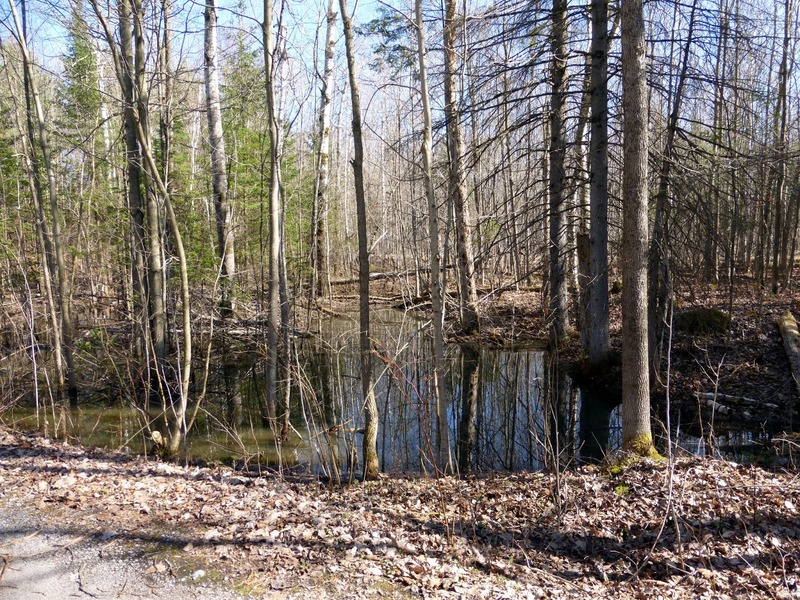 We went to Voyageur Park, just east of Hawkesbury and walked along the road, enjoying the views of creeks swollen and rushing from the spring melt. 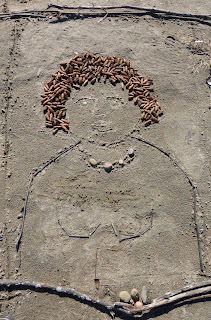 We decided to create our work on the beach. During the summer, this would be impossible because the beaches are packed with people. But in the spring, the park is nearly empty and we had the beach all to ourselves. 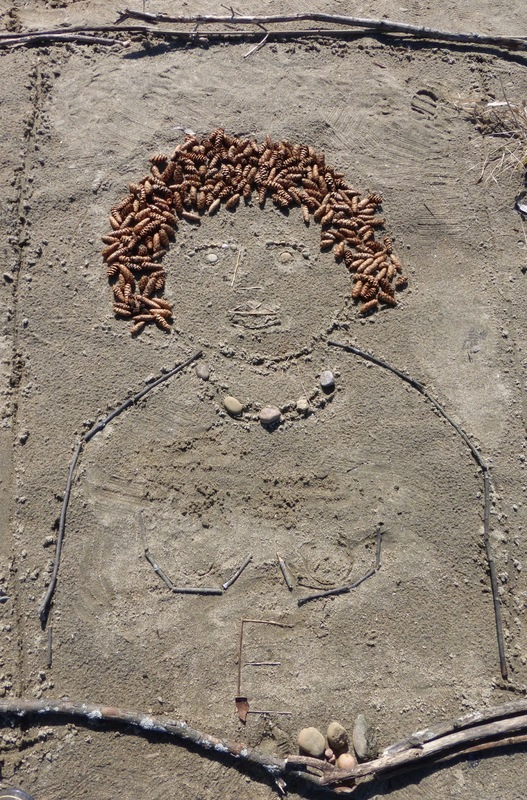 Our plan was to do self-portraits in the sand. 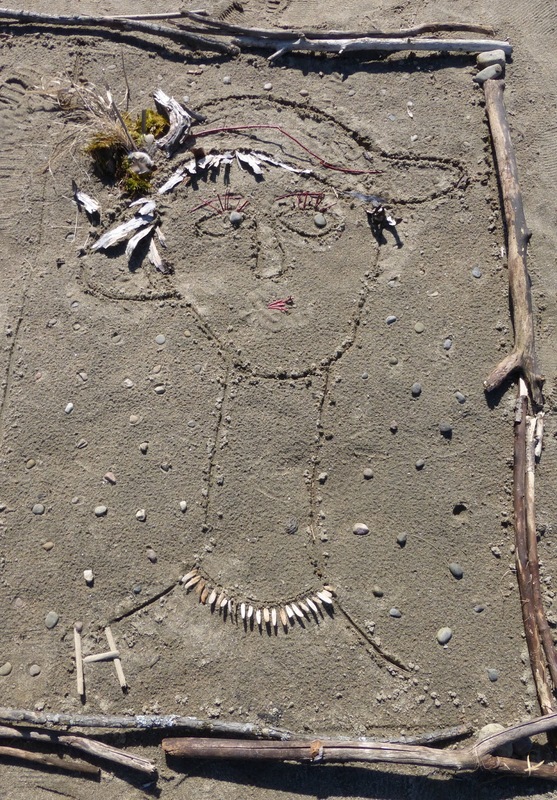 We drew our portraits then decorated them with all the found materials we gathered nearby. 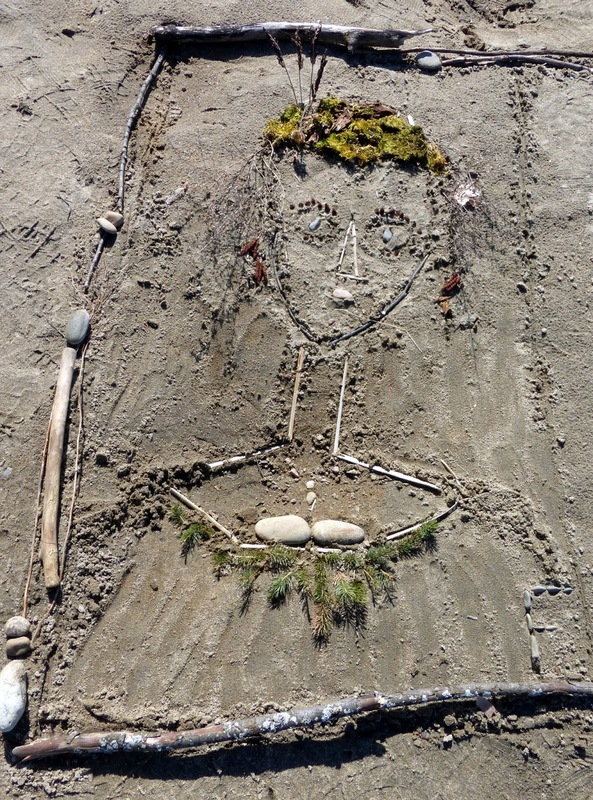 This is Fran's terrific portrait, with moss and stones and branches and seeds and all sorts of wonderful bits and bobs. This is my portrait. 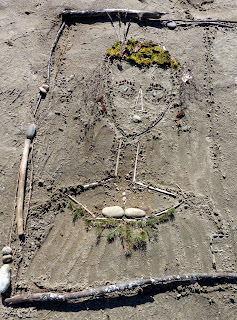 I spent just about all my time creating my hair out of pine cones and had minimal decoration elsewhere - just a few stones and some sticks. But the hair really works - it looks like my hair really does. 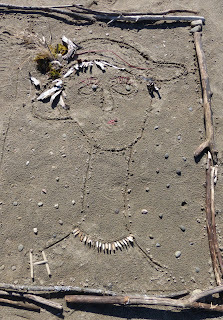 This is Holly's wonderful self-portrait. She made this marvelous hat with bits of moss and wood and seeds and feathers. What fun! All three portraits comprised a triptych - with Fran's (F) on the left, mine (E) in the middle, and Holly's (H) on the right. The portrait of FEH. It was hard to get a good picture of all three together. Especially for short little me. It would have been nice if we could have climbed a tree to get the proper camera angle, but of course that was impossible. We took a lot of pictures anyway. At one point I saw Holly taking pics in one direction and Fran in the other, which I thought made a funny shot. I made one final addition to my self-portrait before we declared the work finished. I really wanted to add more decoration, so put some pieces of bark down to create texture. There! That's better. Then we decided to take a pic of our shadows as we stood over our self-portraits. On our walk back through the park, we saw a lot of pretty scenes like this. No leaves on the trees yet, but you could feel life returning and plants waking up and the promise of the season to come. A great day for beginnings! This is so beautiful! Inspiring!